The natural stone industry sees a high demand for both soapstone and marble as well as granite, quartzite and other exotic stones, so it is vital to keep a well-stocked inventory of available stones at your slab yard. Customers are not consistent in their demand for light or dark colored stones, so a slab yard should have a good sampling of many stone colors. While marble is historically known as the most dramatic and luxurious natural stone on the market, there are other stones like soapstone that similarly set the tone for a beautiful kitchen. Soapstone creates a dramatically different look than the polished look of marble that is a little more rustic. 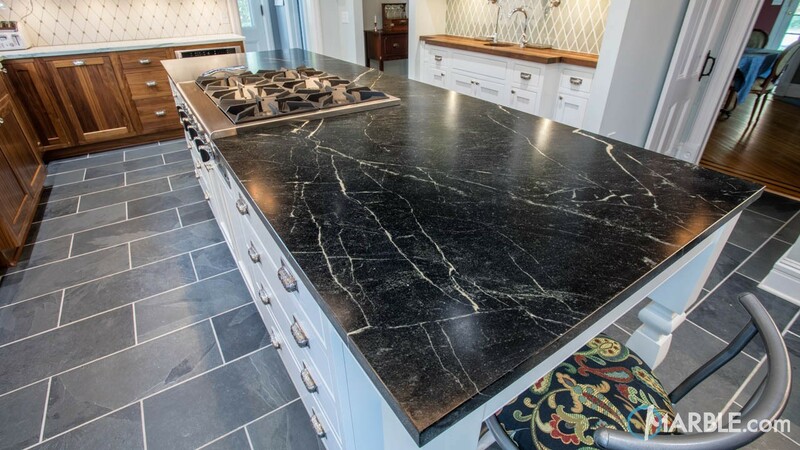 The addition of soapstone contributes to a warm kitchen environment that can be incorporated into all types of kitchen design from craftsman to traditional kitchens. Soapstone is non-porous and stain resistant and will darken as time passes, ultimately developing a patina. Homeowners can accelerate the darkening process by applying mineral oil to help soapstone develop a dark patina faster. Soapstone can look almost black, but can also have an underlying hue of green. The applied mineral oil does not seal or protect the stone like a traditional sealant product. Barroca soapstone is soapstone found in Brazil that is known for dramatic white veining throughout the stone that is not unlike the look produced from rich veins on marble. Although soapstone is usually grey in color, there are a number of dark and lighter grey sopastones that you can choose from. Soapstone is non-porous, so it will not etch or stain from acids. Cleaning soapstone is also a breeze- you can use soap and water or even daily household cleaners without worrying about damaging your countertops. Soapstone is not a hard stone and can easily be scratched. It is not recommended to cut directly on a piece of soapstone. Slab yards need to have an adequate stock of marble on hand to meet the constant need for marble kitchen countertops, vanities, and more. Marble is known for its rich dramatic veining and it becomes a dramatic and beautiful addition to any home. With marble’s beauty comes a lot of maintenance. Marble needs to be sealed up to 4 times a year with a product such as Mr.Stone's Superior Zero Ultimate Stone Sealer, but even with the routine application of the sealant, marble may etch when exposed to acids. Marble can be cleaned daily with soap and water or with Mr.Stone’s AGM Daily Stone cleaner that contains sealant within the formula. Every time you clean your countertops with AGM Cleaner, you are essentially protecting them. Light countertops continue to be popular year after year because they make space feel large and expansive. Light colored marble like Crema Marfil marble or Mountain White Danby marble are always popular marble options and should be adequately stocked at your slab yard. Because marble requires so much maintenance, it is not always suggested for high traffic kitchens. Instead, it can be incorporated into a kitchen’s design in an accent area, such as a baking station. However, there are still people willing to take a chance of installing marble for their kitchen countertops. If this is the case, wipe up spills as fast as possible to avoid damage. A slab yard needs to supply a full range of popular stones dominating the natural stone industry to satisfy its customers. It is not enough to just have one type of each stone as even the colors within different types of the same stone can vary considerably. We at Slabmarket have one of the largest inventories in the area and can provide you with the full range of stones to meet the demands of your customers. We can ship you a container that you fill through our site and we ensure that your stones will be perfect upon arrival. Soapstone countertops are a great choice for those wanting a low maintenance stone that works with many kitchen designs, but marble continues to appeal to many consumers seeking the classic and iconic look of marble. Either way, you will be installing a countertop that will be a true piece of beauty and increase the resale value of your home at the same time. 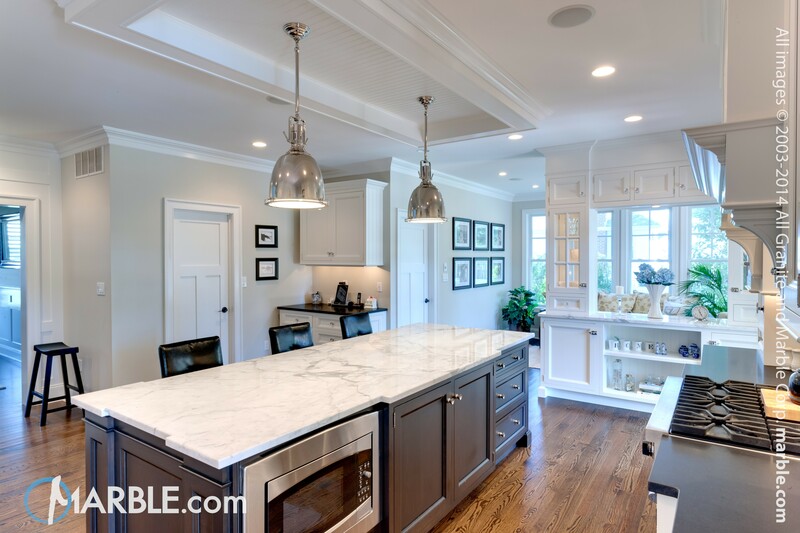 Click here to view one of our favorite kitchens with marble installed by Marble.com!